Flat bag that is easy to heat seal. Shrinks up to 40% of original size. Place item into the proper size shrink bag. Fold over the open end of the bag and tape in place. Use a heat gun or a hair dryer to shrink the bag. All bags come with a one very small hole that allows air to escape while the bag is shrinking. COMMENTS: I use these for all my products.. that I can. Makes my soap look professional & helps my mp soaps not sweat, Cp soaps look professional but I always leave one out so they can smell them. Never have enough of these . "Professional looking product bundles, but..."
COMMENTS: Good for putting together a polished looking bundle of products, but can take some finesse when using them since they're a bit fragile. They seem to hold up better once they've been shrunk to products with a heat gun. COMMENTS: I love using these bags! They provide a great way to wrap up my products that looks very neat and professional. I wish they came in a size larger as well. "A little more crinkly than expected"
COMMENTS: I purchased this size, over the 4x6 to be able to custom fit certain products. I will heat press and quarter the bags and they keep sealed until cut or torn open. I will say that these bags have a distinct smell, above the standard plastic smell. Out of the bag, they do stink. But, over time, this will air out and is no longer an issue. It also doesn't alter the smell of the products. These bags shrink smoothly, when properly sealed. If there is a small hole in the seal, they tend to wrinkle a little more than when properly sealed. COMMENTS: I ordered this size because I can use it on large or small bars. I also use it to package sets. Can't waiting to see what else I can package with these. COMMENTS: Finding these little gems have increased my packaging speeds by 10x's!!! I embed a lot of MP soap in my CP soap, so I have to have some sort of packaging that protects the MP yet still let's the overall bar breathe and cure out. These bags allow me to do this so easily and it gives my products a nice, finished, professionally packaged look. If I want breathing holes, I simply take my heat gun a little closer and it pops tiny holes in them with no problem at all. I can fold the corners and with little effort, create nice straight sealed edge. I love these bags, and will always use them in the future. It also creates a nice surface for me to place my labels on, and if I mess up, I can usually peel the label right off and reapply if needed. COMMENTS: love this size for large items. These bags make it simple and quick to wrap my products. COMMENTS: I use these bag for Larger Candles and Soap Cupcakes. They shrink easily and I don't get holes or seams opening. "Perfect for wrapping a set or row of product"
COMMENTS: I recently made some rectangle bath truffles and didn't want to individually wrap them, so this bag works well for sealing a stack of them. COMMENTS: These work wonderfully to protect MP soaps!! 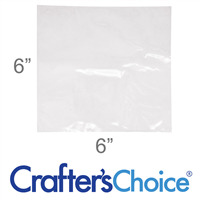 "Crafters Choice™ Shrink Wrap Flat Bags - 6 x 11"
COMMENTS: These work well, but about 1 out of 10 will split the seam on the side. COMMENTS: The smaller size was slightly too small for my bath bombs, so I buy these and cut them in half and they're perfect! COMMENTS: Easy to use and does the job!! COMMENTS: So easy to use for almost everything! Ran out of smaller shrink wrapping and was able to cut and heat seal to fit different types and sizes of product containers. LOVE these bags! Truly versatile. Used a heat seal wand to seal edges and turned one 6 x 11 bag into 4 much smaller bags for sample size products and lip gloss and perfume sticks. Once, in a pinch, I cut them across to use like jar wraps - worked great. Never want to be without these again. Thanks WSP. COMMENTS: These fit my 3 x 3 soaps perfect with a little room to spare! When I shrink wrap with a gun they do not tear either! COMMENTS: I had some trouble in the beginning but, after getting the hang of them...I LOVE THEM!! One of the things I most struggle with is packaging, and this solves most of my troubles; one being the time I spend packaging.I adore these because I did not have to invest in a heating gun, which was my fear but, they work with a BLOWDRYER in which I purchased from the thriftstore. You can't go wrong with these whatsoever. I purchased these in the larger size and cut them in half to then have 2 separate bags for my bars. I used them in there entirety for packaging larger products. Great!! COMMENTS: These are great for my larger specialty soaps. They do have an odor but it dissipates in time. COMMENTS: I like this product and I can get 3 bars of my cpop soap from the long soap mold wrapped with each bag. There is a slight learning curve but not bad at all. You really become proficient with repeated use. I wanted the medium size bags but they were out of stock. I will still try them next time because these are just a touch too big and leave some wrinkles. I just use a blow dryer on hot setting and it works well. 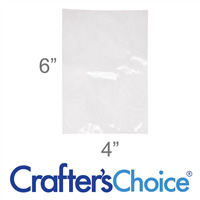 "6 x 11 Shrink Wrap Bags"
COMMENTS: These are terrific. I recently purchased this size bag, when my usual 6x6 size was repeatedly "out of stock" What a happy turn of events, I don't think I will go back to the 6x6, I found working with the 6x11 much more convenient, and having the larger size on hand, enabled me to make-up, some quickie gift baskets for customers. COMMENTS: Love these as they were a great help in keeping my MP soap from sweating especially in the tropic weather. It also give it a professional look of my end product. COMMENTS: These are just as described. COMMENTS: I enjoy all the shrink wrap bags. These are great for tall soaps & odd shaped novelty soaps. I also like this size to group a few items together. COMMENTS: These shrink wrap bags are amazing. Works well every time. Never had a blow out. Very nice product. I use a heat gun to shrink the bags and it works very well. These are my favorite way to package my soaps. "Love these shrink wrap bags!" COMMENTS: This size is great for me as I can use it for larger soaps and then in I have smaller bars I just cut the bags in half and can use 1 bag for 2 items! You just have to use tape to seal open ends and nothing ever goes to waste barely ever! I will purchase this item again and again and recommend it to all! It is great for new and old soapers and it makes anyone's products look professionally sealed every time! I just use a hair dryer and didn't have to spend money buying a heating gun as the hair dryer works perfectly every time! Thanks for having another great product and please keep this item in stock forever as I LOVE this size! Thanks WSP!! • would like them to be a bit cheaper! "I like them for melt and pour"
COMMENTS: Inexpensive. Works well. has a weird rubber tire smell-not sure if that's normal. They're pretty good for the price. "Can be used for SO many things! " COMMENTS: When I have something awkward shaped I turn to this! I can even place up to 6 items & it looks so nice & professional! For my cold process soap, I just trim off the sealed edge so both sides can breath , Works great for little gift boxes ~ I could go on & on! 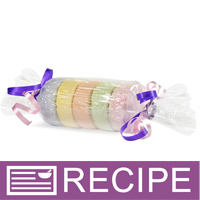 COMMENTS: Easy to wrap soaps without loosing product freshness. I like to cut the bags open for easier wrapping. COMMENTS: GREAT VALUE,Love these especially for wrapping M&P soap. I leave a small slot to still smell the product, but you don't have everyone's hands all over the product. COMMENTS: I cut these to fit my soaps and am able to wrap 2 soaps if I cut bag in half. Sometimes I have enough left over to wrap small guest soap as well. Great buy. COMMENTS: Luv to wrap my soap in these bags because it you cut in 1/2 you get 200 bags!!!! WooooooHOOOOOO!!! "6 X 11 inch shrink wrap"
COMMENTS: Rarely use, but it's great to have!! I made a bath bomb that was so large I needed this size! COMMENTS: Worked great for small flat gift baskets. COMMENTS: I initially bought these for my soaps but it is WAY bigger than I need for them. I can cut it in half and it is small enough to fit my soaps, and it works great on other products-bottles and jars..so it was not a waste of money..I just need to order a smaller size for my soaps the next time I order. COMMENTS: Perfect for my duck soaps! "works well for one item at a time do more than one"
COMMENTS: I like the way they work with the single product sealed in them. But I don't like that they don't make a tight seal if you have multiple items in a package. COMMENTS: These work great especially for larger soaps like ducky soaps. COMMENTS: Nice convenient size for shrink-wrapping jars and large bars of soap. "Perfect for wrapping soaps "
COMMENTS: This is an excellent starter product for wrapping soaps and various other products for shipping. Extremely easy to use without the need for expensive tools. COMMENTS: It works perfect and I love it. COMMENTS: Perfect size. Just what I needed. COMMENTS: Perfect for shrink wrapping soaps! COMMENTS: I use this for various purposes and is great will definitely be re-buying. COMMENTS: These are great for odd-shaped products. I put my soap on a soap saver dish and shrink wrap them together using a heat gun. "These shrink bags work great!" COMMENTS: These bags are great for my M&P and CP soap. They shrink down very easily, protect the soap and give your product a professional look. COMMENTS: I make small 1oz size bath bombs and this shrink wrap size is perfect for my 10oz of little bombs. I do farmers market and outdoors craft shows, so I like to keep the moisture out, it protects the bombs, your hard work and profit! COMMENTS: I use these to wrap my bigger bars of soap. They close easily and have a much more professional appearance than cling wrap. "great for use of sealing items"
COMMENTS: Used these to shrink wrap a gift set of a soap dish and soap. Worked wonderfully. COMMENTS: I have ordered from other companies and these work perfect for packaging soap. "Bags are good-I need more practice"
COMMENTS: Just got these today, tried the 6x11 because of the reviews saying you can get 2 for 1, well I am ordering the 4x6 ones next because it't too much time wasted cutting the larger bags & I think the smaller ones will come out neater. I wish they came with basic instructions also, as stated in one review,because I can't get that nice flat professional looking fit...I tape the ends use a hair dryer & still have unsightly crumpled ends...it's not the bags fault...help! "Crystal clear and wraps tight"
COMMENTS: These wrap up so tight that you can't smell the bars through them. I just leave a couple of bars unwrapped. BTW, you can shrink them in the oven. I set the oven to 425*F, wrap and tape a whole bunch of bars, and set them on a metal cooling rack. When the rack is full, I pop the whole thing in the oven for about 20 seconds. Works like a dream. COMMENTS: These are great. And you can even make 2 wraps on many things saving even more money! COMMENTS: First using any shrink wraps and I really like this one. You can fit 3-2 oz. round soap with one bag. It saves me using the 4 x 6 shrink wraps. COMMENTS: This is the only bag I have ever used to shrink wrap my soaps. Very economical by cutting in half, making 2 bags out of one. "what gauge are these ?" Staff Answer These bags are 80 gauge. "Do these work well for Bath Bombs that are 2.75"?" Staff Answer These should work fine for a larger bath bomb. "I make 2.5 and 3" bath bombs and bath fizzies. What size shrink wrap would you recommend?" Staff Answer You can use both the 4 x 6 and the 6 x 6 bags. You can cut them down a bit if they are too big.
" Does it make a difference if they are poly or pvc? which are these?" Staff Answer They are made of 03 PVC and they can be recycled and there is no major difference in the final product between poly or pvc it is all dependent on personal preference. "Would this fit a 4x4 1/2 candle without a problem?" Staff Answer The Katharina - This shrink wrap bag is 6 inches by 11 inches. The candle would fit inside without a problem, but might be too big. You can always cut this bag down to size to fit your candle better. The 6x6 shrink wrap bag might be a better fit. "Would these bags be suitable to use on an 8 ounce jar? I make sugar scrubs and can't seem to keep them from leaking, so was thinking of using these bags to help with that issue." Staff Answer The 6x11 is a bit too tall for our 8oz jars. I would recommend the 6x6 shrink wrap bag. These will provide a better fit and should shrink around the jars without any excess. Can you offer some suggestions regarding the leakage issue? I changed the formulation of my scrubs but there is still seepage from the covers and it not only makes a mess in transport, but it also looks unprofessional. I was thinking of using the shrink wrap bags over the jar, then screwing the cover down over the shrink wrap. Does this seem like a reasonable way to package? "do these have to be closed with a heat sealer? or will tape do just fine? the tape won't come undone?" Tape will do and won't come undone. You just won't get the finish that shrinking the plastic gives to the product. "When your done shrink wrapping your soap can you cut off the part you taped down? Or will that make a hole in the package? I watched the video but she left the taped parts alone after she finished shrink wrapping them, i don't really want that on my soaps if i decide the shrink wrap them. So do you leave them or can you get rid of them for a cleaner look?" I just slide my bar into the package and seal with the heat gun, if you point the heat gun at the ends where it looks "messy" it usually melts nicely. I never have had to trim any excess wrapper off. (if you have excess maybe consider getting smaller sized bags.) Hope this helps! Instead of cutting it, you could try heat sealing it. Many people simply use an old iron and slide it across. That will seal the plastic so that when it's shrinked, there's no excess left over or needing to be taped. "Are the shrink Wrap Flat Bags - 6 x 11 open on the short side or the long side? " Staff Answer This bag opens on the 6" side. "HOW exactly do you use these? I see people saying they tape them. Do you take the tape off after you shrink them? Do you use a hairdryer or an hot gun for these? With the lack of instruction, I would be hesitant to use these." Staff Answer We recommend taping them closed and leaving the tape on after shrinking the bag. Many customers then place their label over the tape. We use a hair dryer when using the shrink wrap bags but a heat gun is also effective.